Joyce offers mechanical counters for screw jacks and actuators. These allow position tracking for manual operations. These convert the rotational movement of the input shaft into a numeric readout at the counter. It is important to know the size of increments to be measured ( for instance inches or millimeters) and the number of decimal places to be measured and displayed (for instance 0.000" or 000.0"). 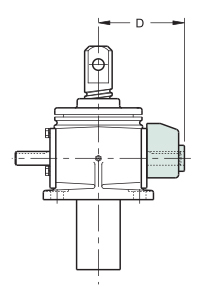 Standard count increases as the lifting screw of the jack extends, but customers may request the count to decrease to suit their requirements. Choice of counter is dependent on the diameter of the worm input shaft on which they will be mounted. Selection of internal ratio of counter is dependent on the number ot turns per inch for the specific jack. If counters are used on jacks with hand wheels, a longer input worm shaft can be specified to permit both handwheel and counter to be mounted on a single shaft. Contact Joyce/Dayton if counters are to be mounte on the shafts of other components. Since counters (CNTO) are mounted directly onto jacks and actuators, they are specified as part of the complete part number. Refer to the ordering section for the products on which they will be used. Standard count increases as lifting screw extends. Longer wormshafts are available, contact Joyce/Dayton. Ordering information is found within specific product sections.